Thinning hair is a common, although irritating symptom of menopause. Typically, everyone loses around 100 hairs per day. Bodies naturally replace this hair loss, but it becomes harder for the body to do so with age. 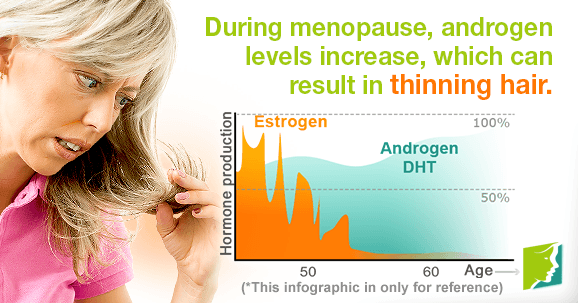 Many women experience thinning hair and hair loss during the menopause transition because of the fluctuation of hormones, specifically estrogen. Thinning hair is defined as the loss of hair density, rather than the complete loss of hair. Thinning hair results in patchy areas on the scalp, and can severely affect a woman's self-confidence. Thinning hair can be caused by a number of things, like poor diet, vitamin deficiency, and excess stress, however, the primary physical cause of thinning hair in women is hormonal imbalance. Thinning hair and hair loss can be caused by lifestyle factors, such as excessive stress, poor diet, lack of exercise, and vitamin deficiency. Thinning hair can also be caused by internal factors like genetics and hormone imbalance. Hormonal fluctuations usually occurs in women during times of menstruation, pregnancy, and menopause. The decrease in estrogen levels before menstruation and during perimenopause allows for an increase in other hormones, like testosterone, in relation to estrogen. Testosterone is the main hair-producing hormone in the body. However, testosterone also shrinks the hair follicles, so when female hormones drop, testosterone dominance causes female-pattern hair loss. Dihydrotestosterone (DHT) is an androgen, or a male hormone, that is derived from testosterone. When androgen circulation increases, hair regrowth might be stunted. For that reason, hormonal imbalance is the primary cause of thinning hair in women going through menopause. It is important to try and restore estrogen levels in order to prevent this from happening. There are several natural hair thinning treatments, which include lifestyle changes, maintaining a proper diet, and a few herbal remedies. Good habits that can help with thinning hair include reducing and managing stress. Incorporating low-impact activities like yoga, swimming, or walking into your daily routine has been shown to significantly reduce stress levels. Maintaining a proper diet is vital to restoring estrogen levels, as well as your overall health. Try incorporating all of the food groups into daily meals, especially foods rich in protein, iron, and fatty acids. Salmon, eggs, avocado, and nuts are all hair growth-promoting foods. Herbs may also help prevent thinning hair. Rosemary, lavender, and jojoba oil are all beneficial in soothing the scalp and also encouraging hair growth. Herbs that contain estrogenic compounds, such a soy, may also help balance out low estrogen levels. More than 25% of females over 50 experience significant hair loss at some point in their lives. Thinning hair is unfortunately a common symptom of menopause that many women have to deal with. It is important to understand that hormone imbalance is the primary physical cause of thinning hair in women, so restoring estrogen levels is key. Natural ways to raise estrogen levels include maintaining a healthy diet, getting plenty of exercise, and trying herbal remedies for hair loss. Do High Testosterone Levels Cause Hair Loss? Learn about the role testosterone plays in the female body; discover how testosterone dominance could lead to hair loss and how this can be treated. Understand the role of the thyroid in the body. Learn how thyroid disorders cause hair loss, as well as ways of managing this distressing symptom.